When I find a product, and especially a company that I love, I want to tell everybody. Glass Dharma is one of those companies. I love straws for my smoothies, juices and other concoctions, but don’t like the feel of plastic, or the fact that they quickly become landfill. I have tried stainless steel straws, and they are not bad, but my favorite are glass. I love them so much that I have given them as program gifts to my coaching clients, as well as hostess gifts and birthday presents. Everyone seems to love them, my teenage daughter included. 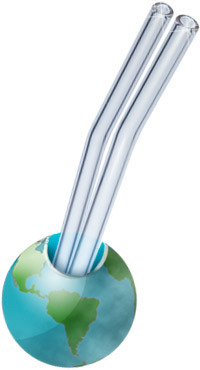 Glass Dharma offers several different sizes and styles of straws, which actually does make a difference. My first purchase was for the “Iced Tea” size, 9.5 mm x 8″ long, without the bend. They are great for water, coconut water, or fresh juices. I then purchased the “Smoothie” size, 12mm x 9″, which is noticeably thicker, but works great for the consistency of smoothies, especially when I’m done adding in all of my goodies, which can make them quite thick. One day my daughter was grabbing one out of the cupboard, and several went crashing to the tile floor. Sadly, two were broken in the spill. I remembered that Glass Dharma guarantees them for life, so I wrote to them telling them what happened. They immediately wrote back, sending a link to a form which asked a few simple questions such as description of what broke along with my contact info. Within minutes I had an online code good for the retail value replacement of the straws. All I had to do was select what I wanted (it didn’t even have to be the same style) and pay the shipping. A few days later, the replacement straws arrived, hassle free. How great is that?! With my replacement credit, I ordered the “Beautiful Bends” Iced tea size, and I think they are my favorite. There’s something so fun and elegant about drinking from these straws. Another plus is that drinking the colorful antioxidants in said concoctions from straws don’t coat and stain the fronts of your teeth. If you are considering getting straws, order the cleaning brush, too. One is included if you order in sets, or they can be ordered separately, and makes cleaning them quick and easy. Liquids can easily be rinsed, but smoothies and even juices can really coat the inside, so the brush is necessary to get them completely clean. These really do make great gifts for yourself and for friends, so give them a try. A little bit of elegance in our day counts as self-care to me. And we could all use more of that.